The last in a series of strategy-based video games, Starcraft II: Legacy of the Void pulls off the rare feat of ending a trilogy of games on a high note. 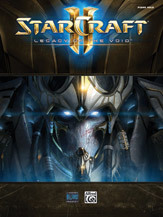 Much-awaited by fans of the series, Legacy of the Void sold a million copies in its first 24 hours and was praised by critics the world over. This book contains piano solo arrangements of the music from the game, plus a 4-page insert of full-color art. Titles: The Stars Our Home * Khala's End * Oblivion Awaits * The Keystone * The Fall of Shakuras * The Golden Armada * Last Stand * Honor Guides Me * Second Chances * The Firstborn * The Spear of Adun * My Life for Aiur.